5 – 50 Year Sentence for Robbery, Home Invasion, and Murder. The mastermind behind a botched Sept. 2014 robbery in northern Kent County that left the homeowner dead apologized to the victim’s family Tuesday, saying he never thought it would turn out so badly. 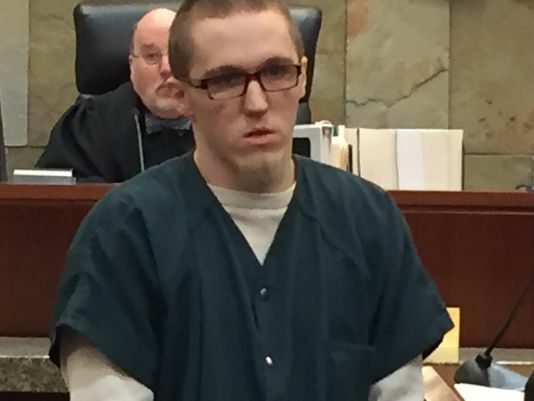 “Never in a million years did I think the people involved were capable,” 23-year-old Zachary Wayne Bennett told the family of Brent Luttrell, who packed the courtroom for Tuesday’s sentencing. “My life changed forever that day too. “I just hope you guys are able to heal and forgive me,” he added. Bennett was least culpable in the Sept. 8, 2014 “commando style” raid and cooperated with investigators, resulting in the lightest sentence of the six. The Lyons man backed out at the last minute and was not there when the others broke into Luttrell’s home and killed him. For conspiracy to commit armed robbery, Kent County Circuit Court Judge Donald Johnston sentenced Bennett to serve between five and 50 years in prison. For conspiracy to commit home invasion, he was given a 5 to 20-year term. The sentences are concurrent, meaning he’ll serve them at the same time. Bennett planned the robbery in the mistaken belief they’d find $80,000 in cash and drugs in the man’s Spencer Township home. Four of his co-defendants wore masks and burst into Luttrell’s home on Pinewood Street NE, rounding up several people, including a child. A fifth waited in the getaway car. Luttrell jumped from an upstairs window to escape, but was quickly subdued. Luttrell, 34, was shot four times. He was still breathing after being pushed from the fleeing car onto Lincoln Lake Avenue NE, but died a short time later.